Sophisticated & Well-Designed unique, Custom DEPAULO built home on a private, wooded Cul-de-sac lot backing to Danada Farm Forest Preserve. Bike, hike & snowshoe trail access from backyard. Award winning District 200 schools. This home is graceful & stylish from the dramatic 2 Sty Entry to the formal Living & Dining Rm quality abounds. The inviting, remodeled Gourmet Kitchen W separate Breakfast Nook & delightful Sun Rm overlooking the woods is perfection! 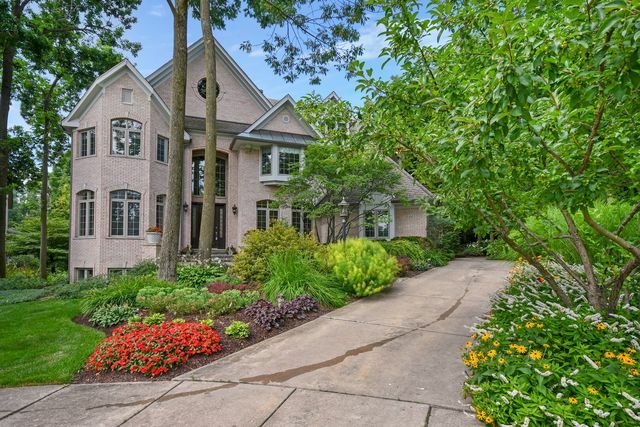 So much to offer in this 6177 sq ft home from the Architectural Design & Craftsmanship that you expect in a luxury property to 1st & 2nd Fl Master Br Suites both w decks overlooking Forest Preserve. Gorgeous 2nd Fl Master Suite is highlighted by a Sitting Rm, separate Nursery Rm, Luxury Bath & 2 WIC. BR 2 & 3 feature Jack 'N Jill Bath w BR 4 having a private Bath. There is a large Bonus 5th BR & Loft on the 2nd Fl; Plus a Den/Office located on the upper landing. English Fin Bmt w Wet Bar. Minutes to Danada stores, I355 & I88 & movie.